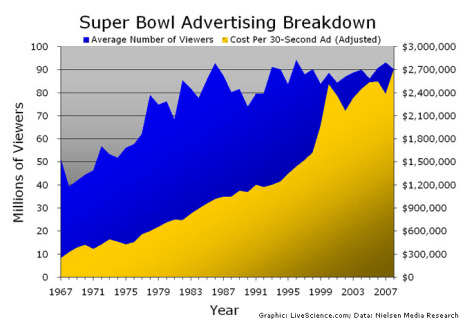 Do Super Bowl ads get you to spend money? Super Bowl advertising since the first big game in 1967. Although the average numbers watching at any one time (blue) have flattened in recent year, the price of buying TV air time for advertising has continued to increase drastically even when the prices are adjusted for inflation (yellow). Will the jacked up prices pay off for advertisers?